In the Creed, we find the affirmation that Jesus “ascended into heaven and is seated at the right hand of the Father.” The earthly life of Jesus culminates in the event of the Ascension, that is, when he passes from this world to the Father, and is lifted up to His right hand side. What is the significance of this event? What are the consequences for our lives? What does it mean to contemplate Jesus sitting at the right hand of the Father? Let us be guided by the Evangelist Luke. We begin from the moment Jesus decides to embark on his last pilgrimage to Jerusalem. St. Luke notes: ” When the days for his being taken upwere fulfilled, he resolutely determined to journey to Jerusalem” (Lk 9:51). While he “ascends” to the Holy City, where his “exodus” from this life will be accomplished, Jesus already sees the goal, Heaven, but he knows that the path that brings him back to the glory of God passes through the Cross, through obedience to the divine plan of love for humanity. The Catechism of the Catholic Church states that ” the lifting up of Jesus on the cross signifies and announces his lifting up by his Ascension into heaven, and indeed begins it” (n. 661). We too must be clear in our Christian life, that to enter into the glory of God requires daily fidelity to His will, even when it requires sacrifice, when at times it requires us to change our plans. The Ascension of Jesus actually happened on the Mount of Olives, near the place where he had retired in prayer before his passion to be in profound union with the Father; once again we see that prayer gives us the grace to faithfully live out God’s project for us. At the end of his Gospel, St. Luke narrates the event of the Ascension in a very synthetic way. Jesus led the disciples “[out] as far as Bethany, raised his hands, and blessed them. As he blessed them he parted from them and was taken up to heaven. They did him homage and then returned to Jerusalem with great joy,and they were continually in the temple praising God “(24.50 to 53). I would like to note two elements of the passage. First, during the Ascension Jesus fulfilled the priestly gesture of blessing and certainly the disciples express their faith with prostration, they kneel and bow their heads. This is a first important point: Jesus is the only and eternal Priest, who with his passed through death and the tomb and rose again and ascended into Heaven; He is with God the Father, where he always intercedes in our favor (cf. Heb 9:24). As St John writes in his First Letter, He is our advocate, our advocate with the Father (cf. 2:1-2). It’s nice to hear this. The first thing we do when we are called by a judge or are called to trial, the first thing we do is look for an advocate to defend us. We have One who always defends us. He defends us from the insidiousness of the Devil, He defends us from ourselves, from our sins. But, dear brothers and sisters, we have this advocate. We must not be afraid to turn to Him, to turn to him with our fears, to ask for his blessing and mercy. He always forgives us, He is our advocate, He always defends us. We must never forget this. The Ascension of Jesus into heaven then reveals to us this reality that is so comforting for our journey: in Christ, true God and true man, our humanity was brought to God; He has opened the passage up for us, He is like a leader at the head of the rope when you scale a mountain, who has reached the summit and draws us up to him leading us to God . If we entrust our lives to Him, if we let ourselves be guided by Him we are sure to be in safe hands. In the hands of our Savoir, our advocate. A second element: St Luke mentions that the apostles, after seeing Jesus ascending to heaven, returned to Jerusalem “with great joy.” This seems a bit strange. Typically when we are separated from our families, our friends, in a lasting separation, above all because of death, we are naturally sad, because we will no longer see their face, or hear their voice, we will no longer be able to enjoy their affection, their presence. Instead, the evangelist emphasizes the profound joy of the Apostles. How come? Because, with the eyes of faith, they understand that although subtracted from their eyes, Jesus remains with them forever, He is not abandoning them, and in the glory of the Father, supports them, guides them and intercedes for them. 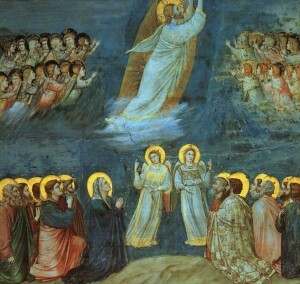 Dear brothers and sisters, the Ascension does not indicate the absence of Jesus, but tells us that He is alive among us in a new way; He is no longer in a definite place in the world as He was before the Ascension; He is now in the lordship of God, present in all space and time, next to each of us. We are never alone in our lives: We have this advocate who waits for us, we are never alone, ? ?the Crucified and Risen Lord guides us, and with us there are many brothers and sisters who in silence and obscurity, in their family life and work, in their problems and difficulties, their joys and hopes, live their faith every day and, together with us, bring to the world the lordship of God’s love.